The center, 2975 S. Rainbow Blvd., Suite B, is set to host six “Didje want to stop snoring?” classes every Friday from 6:30 to 7:30 p.m. between Oct. 4 and Nov. 8. Instructors say the classes may help alleviate snoring and sleep apnea. 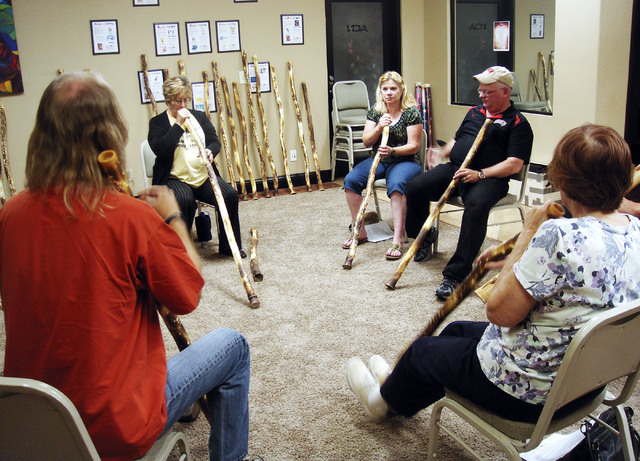 The world may sleep more easily and quietly thanks to a new didjeridu class offered by Music 4 Life, a health club and training center dedicated to providing therapy through music. The center, 2975 S. Rainbow Blvd., Suite B, is set to host six “Didje want to stop snoring?” classes every Friday from 6:30 to 7:30 p.m. between Oct. 4 and Nov. 8. Judith Pinkerton, founder of Music 4 life, decided to host the class when her husband Dennis Burkhardt discovered a medical study conducted in 2006. In the study, researchers monitored 25 patients who were at least 18 years old, complained of snoring and had a moderate to severe apnea-hypopnea index. The patients were required to play the didjeridu at home for four months. On average, they played six days a week for 25 minutes. “(The patients) actually played more than they were asked them to,” Pinkerton said. Compared to a control group, patients who played the didjeridu reported less daytime sleepiness and a lower apnea-hypopnea index. Patients’ partners also reported fewer sleep disturbances. Burkhardt was curious and decided to conduct his own experiment. He played his didjeridu that night and went to sleep without telling Pinkerton about the study. Burkhardt has been playing the didjeridu regularly for the last six weeks and said he continues to see improvement with his snoring. The didjeridu was developed by the Aboriginals of Australia who used tree trunks hollowed out by termites, according to instructor Rick Dusek. Dusek is scheduled to teach a different topic each class, such as various sounds, beats and breathing techniques. Each class costs $10. Health club members play free. A limited number of didjeridus are will be available based on reservations. Monthly Music 4 Life memberships are available for $20 and include free access to a variety of music classes. For more information, visit music4life.us or call 702-889-2881. Contact Southwest/Spring Valley View reporter Caitlyn Belcher at 702-383-0403 or cbelcher@viewnews.com.